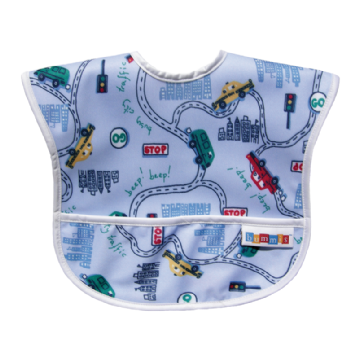 The machine-washable Bummis best-ever bib has a catch-all pocket and snap fastening – and it's made from the same fabric as the Bummis waterproof nappy wraps so you know it's long-lasting and durable. Also distinctive Bummis brand patterns are great conversation starter about real nappies and this legendry Canadian real nappy company! Measures 27cm across and 34cm tall, with a neck circumference of 24-27cm. Wash and dry this bib at normal temperatures in the washing machine and dryer (if required). Avoid fabric conditioners, chlorine bkeach and other whitening agents.